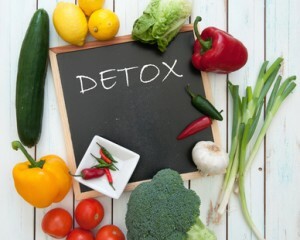 detoxification process, can become overburdened from diet and lifestyle choices. Personal hygiene products full of chemicals; hormones in our meats; pesticides on our fruits and vegetables; and harsh cleaning products contribute to what is called our ‘toxic load’. The more toxins our body accumulates, the higher our toxic load. Unfortunately, our toxic load can be difficult to measure. Diseases tend to develop slowly and insidiously. Most people don’t know anything is wrong until they are diagnosed with something major. To help fight disease, it is important to evaluate the products we use, the foods we eat, and the environments we subject our bodies to. It’s also important to pay attention to the signs and symptoms our body reveal to us. In this blog I discuss 5 common symptoms of a high toxic-load. According to Ancient Chinese medicinal practices it is said that the areas you experience breakouts, for example in between your eyes or on your temples, can be linked to an area of your body (i.e. liver) where you are experiencing an imbalance or tension. Sometimes, these breakouts are caused by what we expose ourselves to. It can be as minuscule as the pollution in our every day atmosphere, or as decisive as the alcohol we drink. Either way our bodies are experiencing a surplus of toxins and acne breakouts are its way of expressing its discontent. A simple way to detoxify your liver is to drink a glass of water at room temperature with a freshly squeezed organic lemon, first thing in the morning. Drinking this helps your body to be more alkaline and flush toxins before you start your day. Another step you might want to take to help yourselves detoxify, is taking part in a 21 day detox diet. Meaning, eliminating all alcohol, sugars, and unhealthy foods from your diet. By doing so, you can eliminate their negative effects on your body. A third option, is consuming high nutrient foods such as beets and pomegranate seeds. This doesn’t have to be an overwhelming step to take…if you are someone, for example, who enjoys smoothies, you can simply add to your greens and berries smoothies, some coriander or parsley to the mix, to aid and your body detoxify itself in a delicious way. It is also important to make sure your hormones are balanced as hormonal acne is a sure sign of imbalances. In so many ways, the lips are the windows to our digestive system. There are certain questions we need to ask ourselves when we begin experiencing dry lips. First, we should consider hydration or a lack of being as a tell-tale sign, that we need to be consuming more water. In another instance, chapped lips could also be an indication that our digestive system is not in it’s most well functioning condition. I am a huge fan of digestive enzymes and probiotics to optimize our digestive systems. Fermented foods are also a great way to get pro and prebitotics in our diet. There are great books available online with great recipes for fermented foods, give it a try and you will be pleasantly surprise how testy they are and how well you will feel when you consume them regularly.. Many people might associate the gloomy look of under eye bags with a lack of sleep but this is another indicator of your interior system experiencing a surplus of toxins. Alongside the eye bags you might also take notice of your body swelling; for example, when you take your socks off at the end of the day and the patterns from the sew have indented themselves in your skin, it is because your body is reattaining water. Overall, we should note that these things are signs that we are not drinking enough and our stressing our kidneys. The well-being of our kidneys can be jeopardized by dehydration….which I should specify does not always mean that we are solely not drinking enough water. Dehydration can also be caused by drinking too many sugary or caffeinated drinks. For every caffeine based drink we consume we should keep a rule of thumb to always drink two glasses of water alongside. Same thing for applies for sugar based drink, which includes the wide range of fruity-flavored ones. When filling our stomachs with these sugary ingredients, our bodies require water to help us delude these sugars and draws that water from the cells in our body, making us more dehydrated. Salt is another big culprit of dehydration, and you have to watch your consumption. Regular salt table is also filled with other chemical so it is better to use sea salt or Himalayan salt. It might sometime be wise to try to cut proteins from our diets for about a week to help give our kidneys a bit of a break. Water-crest, parsley and detox teas are also a great way to help activate your kidneys and liver to allow them to move and release the toxins they are trying to be processed by your body. Many women find themselves with cellulite and it is a sign that the liver, kidneys and the lymphatic system may not be working optimally to remove the toxins from our bodies. What many people do not realize is that cellulite can stem from improper nutrition in our childhood. It is so crucial for youngster to implement proper nutrition into their lives as early as possible. Sometimes we forget that our youth sets the stage for our later years in life. Overall, however, cellulite can be a result of: a diet high toxic load diet, medication, alcohol, not enough movement and exercise. There is so much that can be done for cellulite with a “cleaner” diet. Lemon water in the morning, including more greens in our diet and sweating via exercises can make a huge difference. We can activate our lymphatic system with brushing, keeping the strokes towards the heart, or with a trampoline or rebounder to move the lymphatic fluids throughout our body. Sweating is also very important as the body eliminates via our feces and urine but also via our sweat. So keep moving and get out there and sweat it out with your favorite exercises. I am also a big fan of infrared sauna to help you detoxify. Saunas enhance circulation and oxygenate the tissues. The skin is a major eliminative organ and most people’s skin is very inactive as many people don’t sweat at all.